There is a little old lady living in the bushes along the on-ramp by my house. I might have imagined her, but I doubt it. The last time I hallucinated, I was seventeen and driving south on the freeway that runs along the California coast. Suddenly I saw wild animals—giraffes, warthogs, and whatnot—running alongside my car, and keeping good pace, too. I had to steady the wheel in order to keep from grazing them on either side. Then I realized I was sleeping. I actually realized while I was sleeping that I was sleeping. At the wheel. I snapped awake just in time to avoid crashing into the traffic divider. To this day I think those imaginary animals were herding me to safety. Thank you, imaginary animals. Because when I consider the odds of surviving something like that, it comes up a losing bet every time. My mother was a big gambler and taught me to always calculate the odds. She was in her fifties when she lost her job designing weapons for the government. Joblessness shouldn’t have been new to her. The nature of her profession was contract-based, and contracts end. Plenty of contracts had ended in the past, and she’d picked herself back up immediately. But this last time was different. She didn’t get up, or at least not in the way she usually did. Instead she retired as a missile scientist and became a junk dealer. She sold her wares at the swap meet. She wore a coin belt. She became best friends with a man who lived in his car. Until I saw it, I would have put the odds pretty high against this ever happening. But it happened. Unlike the hobo who panhandles along the I-20 off-ramp around the corner from my house, the little old lady doesn’t have a cute dog she outfits in baby clothes to solicit generosity from drivers. That’s one successful gimmick, believe me. People throw money at that guy. If I ever become homeless, I plan to panhandle with my dog alongside me, because the odds of getting people to throw money at me would definitely be in my favor. But the little old lady does not have a dog, nor does she have a sign, such as the other off-ramp panhandler whose sign reads, “Dreaming of a Cheeseburger.” In fact, she doesn’t panhandle at all. She lives in the bushes along the on-ramp, mind you. People don’t panhandle along on-ramps. They panhandle along off-ramps, where drivers are stopped waiting for either the light or a break in traffic, and the odds of them rolling down their windows and forking over some cash are much higher. The little old lady is no bigger than a boy, which may explain why she wears the clothes of one: cargo pants, T-shirt, tennis shoes, grotty peacoat. No gloves. Or socks. All filthy, which stands to reason, seeing as she lives in the bushes. I usually see her walking the area around Boulevard where it connects with I-20. She is a curiosity, that one. She is not the “sweet little old lady” kind of little old lady. She stares straight ahead with furrowed brow, her face awash with the burden of having awoken alive that day, her hair solid white and matted, like Einstein’s. Still, I didn’t think she was actually homeless (because what are the odds? )—not until I saw her climbing out of the bushes along the on-ramp, swinging her little legs over the barrier one at a time in order to commence her rickety wandering of my neighborhood. I don’t know why this surprised me, but it did. In my experience with homeless people, which I think is so extensive because I live near downtown Atlanta, they loudly announce their condition somehow, by sleeping in doorways, for example, or brandishing actual signs (“Homeless Man Needs Beer”), or by pushing a small mountain of their possessions—including, in one case, a toilet seat and taxidermied rabbit—around in shopping carts. And the odds are they will ask you for things, and that they will not be tiny and grandmotherly-looking. My daughter says I have a soft spot for “lady hobos,” as she calls them. I’ve packed a bag with food, clothes, gloves, socks, and a blanket. I’m going to leave it near the bushes by the on-ramp, over the barrier. 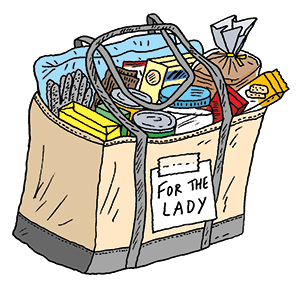 A note on the outside of the bag reads, “For the Lady.” I don’t know if I have a soft spot. It’s just that when I see homeless little old ladies I think of my mother, who taught me to calculate odds, and how the funny thing about odds is that they are not always in your favor. Hollis has a new book! The novel is called Unaccompanied Minor, and you can find out more about it and her writing seminars at shockingreallife.com.